IS IT OR ISN'T IT? going to be a white Christmas? Well, the weather forecasters have said it definitely isn't. So I've decided to buck the disappointingly un-snowy climatic trend by producing the fantasy picture you see above. 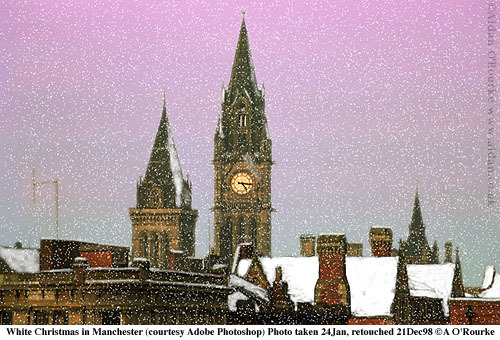 As mild weather is heading our way, this looks to remain a fantasy, though small snow flakes were seen fluttering down on Manchester city centre this afternoon. They soon melted! For muslims in Manchester and all over the world, It's the holy month of Ramadan, and after all the violent and disturbing images we've seen coming out of the Middle East over the past few days, let's meet Susan Jesson-Ward an enterprising and talented Mancunian who has done extremely well for herself in the sunny and peaceful Sultanate of Oman. Can you guess her job? Her ex-boss is pretty well-connected: the Sultan of Oman himself. Includes my pictures of Oman taken three years ago. THE AIR STRIKES ON IRAQ dominated both national and local media during the latter part of last week. In the MEN, Kuwait and Baghdad, rather than Kersal or Blackley, were featured in headlines and photographs, with the face of Saddam Hussein stared out from the pages. Unlike the Daily Mirror reporter who managed to get into Iraq in time to catch the bombardment, I can't be an "Eyewitness in Baghdad", though I was once an Eyewitness in Riyadh, Saudi Arabia. I arrived there shortly after the end of the Gulf War, and witnessed for myself the remains of scud missiles, the masking tape on the windows, and the apocalyptic smoke clouds which on certain days blew over the city months after the conflict ended. The US and UK bombings have been followed closely here. MEN readers voted two to one that there was no alternative to an attack on Iraq. Today they vote on whether it was worth it. There were demonstrations against the action. Anti-war campaigners held candlelight protests on Market Street, and a piece of spray can graffiti near the precinct centre on Oxford Rd says simply "Bomb Blair". Once again, holidaymakers were forced to return to Manchester from Eilat. After the bombardments of the last few days, I'm sure Eilat is as safe from Iraqi attack as Eccles. The impeachment of President Clinton is also a hot topic of debate here, but that's quite enough of that! THE TANDEM USED BY STAN AND HILDA OGDEN, the table used by Sir Matt Busby, furniture from Heartbeat, wardrobes from the Full Monty, Victorian chairs and tables, religious statues, stuffed animals, old radios, tv's and record players from the 60's, classical-style busts, 50's style fridges, World War 2 helmets, an electric chair, a penny farthing bicycle, grandfather clocks, art deco lamps, porcelain statues, a magnificent 1950's pedal car, antique police truncheons, framed paintings, and many many many more items are to be sold at an auction organised by long-established Manchester-based auctioneers Charles Taylor. It's not just for collectors with wodges of cash to spend, anyone can come along: The prices will range from very affordable to... well how much do you think Sir Matt Busby's boardroom table is worth? 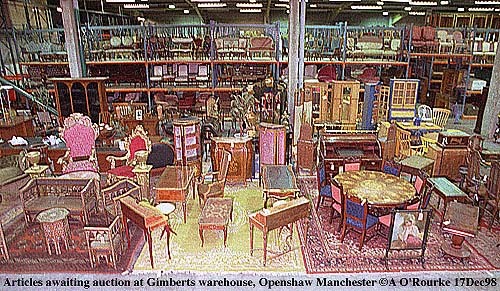 The collection belongs to Openshaw-based Gimberts, the company which provided props to stage, film and tv companies until, sadly, it closed down earlier this year. I went along to the warehouse on Whitworth St Openshaw last Wednesday to look at the collection myself and photograph a few items: it is truly awesome. I'm returning tomorrow to do some more pictures. TODAY, HERMES OPENED ITS DOORS TO MANCHESTER SHOPPERS. The event was heralded in a press advertisement featuring a beautiful 1930's-inspired solarised photograph of a woman wearing a scarf - ah what a welcome change from all that Madchester street fashion, with all those puffed out jackets, trainers, nose, mouth and whatever else rings, and shaven heads - But classic quality comes at a price - you could probably buy a whole rack of items at Affleck's Palace for the same price as one scarf from Hermes. I think it was Yvette Livesey who said Manchester needs an upmarket fashion boutique. 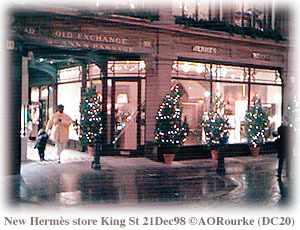 Hermes certainly had a classic Christmas look about it when I photographed it this afternoon with my tiny Kodak DC20 digital camera. 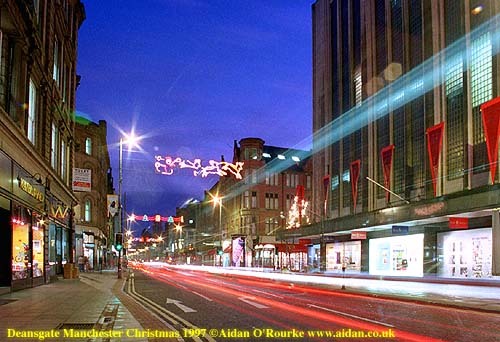 SHOPPERS HAVE HAD PLENTY OF REASONS to come into Manchester. Many stores have been opening up till midnight, and yesterday some opened a half an hour earlier than they are allowed to trade so customers could take advantage of some "browsing time". A brand new Jessop's store has opened at the end of Market Street. I was there today to stock up with film for the holiday period. It's the biggest store in the UK and they now have an on-the-hour processing service. Camera buffs queued overnight to take advantage of opening day bargains, including a �300 video camera for �99. In Albert Square (picture further down), there's an Alpine Market with traders from France selling their own produce. And town centres report that the drop in visitors due to the Trafford Centre isn't as bad as expected. Meanwhile, the Trafford Centre, featured in a "Close Up North" special on Thursday night on BBC2, reports healthy trading. A SYNDICATE OF 27 TEACHERS AT ST THOMAS AQUINAS SCHOOL, CHORLTON has won more than �300,000 on the National Lottery. The news came through on Wednesday - the draw took place a week last Saturday. Some of the teachers have said they will be taking early retirement, though the Head was pleased to note that all staff reported for duty the day after they heard they'd won the mondy. And the City Council is hoping for a Millennium Lottery grant of �300,000 to fund a huge street party to celebrate the millennium. It will take place throughout 2000 all over Greater Manchester. "BIG ISSUE SIR, BIG ISSUE MADAM?" To regular city centre shoppers and workers, their faces and voices are a familiar part of the city centre experience. They stand on street corners selling the weekly Big Issue magazine. Peoples' responses vary: some ignore them, others apologise for not buying, and many stop and chat. A recent issue of the magazine said Deputy PM John Prescott once slept rough. I did too - for one night on a backpacking trip to Poland 19 years ago. That was just one night - these people do it all the time. They often suffer from bad health, but many can't get access to healthcare, as they aren't registered with a doctor. That's why the Big Issue set up their own health reception at their Oldham St offices. The MEN quotes the case of Stevie Smith who died of blood poisoning due to an infected abcess which was left untreated. To highlight these problems, a delegation of vendors and Big Issue staff went to the Houses of Parliament on Wednesday to lobby MP's on the issue of health provision for the homeless. I had an abcess this week, I went to the dentist, and he pulled out the tooth. Cost under the NHS: �23.00. ANOTHER MEDICAL SUCCESS STORY took place in Manchester when Doug Gibson, 77, donated a kidney to his son, also called Doug, aged 51. The operation took place at Manchester Royal Infimary. This makes Doug senior Britain's oldest donor. THE TWELVE YEAR OLD GIRL arrested last week in connection with the death of a baby has been charged with murder. The girl, who has returned to school, will appear before Manchester Youth Court on the 5th of January. A MONORAIL MAY TAKE SHOPPERS TO THE TRAFFORD CENTRE - this option has become more and more of a possiblity as there probably won't be any public funding for a Metrolink line. Sounds great to me - shades of Seattle or Disneyland! As a child I used to imagine monorails radiating out from Manchester along the main highways, like Princess Rd and Ashton Old Road - The reality is an often overcrowded bus with swearing youngsters at the back upstairs. RICHARD BRANSON FLOATS OVER CHINESE AIRSPACE as I write, and may be forced down. Meanwhile fares on Virgin Trains between Manchester and London are going up. The move is to alleviate overcrowding until new tilting trains arrive some time during the next couple of years. And there have been complaints about the closure of Piccadilly Station during the early hours at the weekend. It'll be closed over Christmas too, while owners Railtrack make major structural improvements. PERFORMANCES THIS WEEK HAVE INCLUDED the Hellejujah Xmas Concert at the MEN Arena, three nights of M People at the same venue, the Pirates of Penzance at the Bridgewater Hall, Duran Duran at the Apollo, and the Manchester Camerata at the RNCM. Rod Stewart didn't appear at the MEN Arena last night, due to throat problems, angering many fans who had come long distances to see him. MANCHESTER HAS MADE QUITE A FEW TV APPEARANCES this week. Programmes included "Cold Feet" (BBC2 10pm Sunday) written by Mike Bullen, and in "Rock Babylon with Graham Norton", (Saturday night Channel 4) a celebration of rock'n'roll decadence, the adenoidal Mancunian whine of Happy Mondays' mover and shaker Bez was heard, explaining how drugs powered the Madchester club scene of 10 years ago. Later Tony Wilson recounted once again how the band finished up in a drug-induced stupour. MANCHESTER CITY played Darlington at Maine Rd on Tuesday night. Result: City 1, Darlington 0 but on Saturday they lost to York City 2 to 1. United lost 3-2 to Middlesbrough. THE WEATHER IS COLD AT THE MOMENT - I like it -but by Christmas day the temperature will have risen to 11 degrees, say the forecasters. Yesterday was cold, with a magnificent sunset. Last week was a mixture of cold with milder temperatures and fog. Current EWM temperature: 39f/4c. EYEWITNESS IN MANCHESTER IS UNDERGOING REFURBISHMENT but you won't hear the sound of hammers hammering JPEG images into place, or the odour of HTML colours being pasted into page attributes. However, you may encounter the odd broken link or incomplete picture. Please report if you do, and contact me with any ideas or suggestions for improvements. Eyewitness in Manchester 99 (now where did I get the idea of naming the update after the year?!?) will be ready by the second birthday, on 18 January next. NEXT WEEK'S EYEWITNESS IN MANCHESTER will be appearing as usual. In the meantime have a very Happy Christmas.